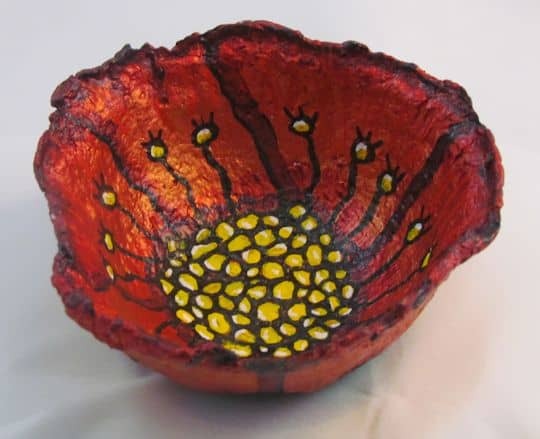 We have a guest post today from Lynn Harriet, who makes wonderful paper mache bowls. Her painting style is great, and the tutorial she wrote for us is really detailed. Thanks, Lynn! I am Lynn Harriet. I live in Stockton California and am a special education teacher by day and an artist by night, weekends and summers. I love painting. I have been painting for over 30 years. I have many canvases hung on my own, friends and families and even church walls. I was looking for other surfaces and forms to paint on. I was also looking to expand the size of my polymer clay experiments. That is when I came across this wonderful site Ultimate Paper Mache full of techniques, recipes and samples of what could be created with paper mache. Thank You Jonni. This wasn’t the paper mache pigs from balloons that we created in grade school. This was an art media in which anything could be created in any size. I appreciate being asked to describe my process for making my paper mache bowls. I think of them as little paintings. The possibilities with this are endless! I use three methods of construction to make the paper mache bowls. 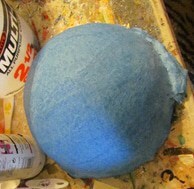 I’ll describe the first process of strip paper mache in this post. The process to make the paper mache bowl is to make the bowl over a form, gesso the bowl, paint the bowl and then apply a finish. The first process I use is the traditional paper strip technique. However I used the techniques that Jonni describes for her masks. I use shop towels and the plaster, white glue, flour recipe. For my forms I use Fat Daddio’s s Hemisphere Pans that I found on Amazon. They come in seven sizes. You can use most any bowl for the form. I also have a set of melamine bowls that I use. 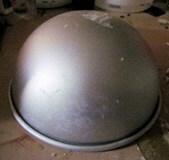 Cover the form with aluminum foil. This makes it much easier to remove the bowl from the form. Depending on the texture I want on the interior of the bowl determines how smooth I make the foil. I like texture so I leave crumples and lines. Rip the straight edges off the towels. Then rip the shop towels into 2 inch strips. Put the towels into a container of water. Then mix up the paste. Don’t mix the paste until everything is ready. You have a bit of time to work. The plaster can dry before you are finished if you mix the paste up before everything else is ready. Now the messy part. Take the strips out of the water and squeeze the water out them. Take one strip on the bowl form and stretch it into place over the curve. Use a brush to put a layer of paste on the strip you just put on the form. If you get some paste on the form that is ok. I try not to get too much on the first layer so it is easier to remove from the mold. Continue to put strips of the towel on the form overlapping edges and painting each strip with paste. Do this until the form is covered. Tear the strips to fit the bowl. Some will be shorter than others. Pull and press on your strips to get them to lie nice and flat. You don’t have to be rabbit fast doing this step but if you go like a turtle the plaster in the paste will dry before you are done. If it does start to dry, throw out the mix in the trash and mix a new batch. I usually can get all layers with one batch. Add a second layer of strips and paste. This time you can brush on paste to the bowl then place the strip. Stretch to fit the curve and add paste and the next strip until the bowl is covered with a second layer. Be sure you are getting glue under and on top of each strip. If you don’t your bowl will have soft spots that will ruin your final product. A third layer is a good idea on the bigger bowls. For the smaller size forms, the 3 and 4 inch ones, two layers were enough because there was a lot of overlap with each strip. It makes a super strong bowl. Usually the edges of the strips extend beyond the bowl. You can fold these back onto the bowl using plenty of paste. You can let them be and cut them off later then apply a layer of strips to the edge once the bowl is dry or leave them as they are. Just be sure they are glued together well. Now the part that requires patience. Let the bowl dry on the form. I put a fan on the bowl to dry. I leave it overnight. You can take it off the form sooner. It can dry in only a couple of hours as the plaster glue mixture dries quickly. Take the bowl off the form, Remove the plastic wrap or foil. Put it back by the fan to let it completely dry. The part that was touching the form will need a little more dying time. If you remove it too soon you will warp the shape and have a bowl that is no longer round. You can sand the bowl once it is dry. I just do just a little sanding because I love the texture that is created. The inside will have picked up the texture of the foil. The outside will have the natural texture of paper mache, this can be rough or pretty smooth depending on how smoothly the last layer was applied. That texture is what will give it its unique look. Apply a coat of gesso on the inside and let it dry. I use liquitex gesso, either professional or heavy duty if I want to fill in a lot of the texture. I have this on hand for my paintings. You can use any brand or mix up a batch of Jonni’s gesso. Sand the edges of the bowl with a light pressure to remove the little gesso drips. Now gesso the inside of the bowl. Let dry. Repeat this step if needed. Most of the time I find that one coat of gesso is all I need. If a smoother surface is desired then additional coats of gesso can be applied. You can also sand the dried gesso between coats. At last we come to my favorite part painting the bowl. To achieve a look similar to mine you need acrylic paint. I use Liquitex basics and soft body, Golden fluid, Sargent Art liquid metal and Jacquard Lumiere Acrylics. Because of my years of painting I have tons of paint. Some are more expensive than others. Use whichever colors and paints suit you budget and the look you want. Decide whether you are going to paint a design on one side or both. Many of my bowls have the design on either the inside or outside. Then the other side has one color usually a metallic. You can sketch out your design or create it freehand. 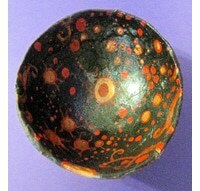 Paint your bowl with one color. This is where I use my metallic paint. First paint the inside and dry then paint the outside. Follow with a second coat and dry. You can be finished here or for an old looking finish that emphases the texture. Paint on a layer of a darker color. This can be any dark color depending on the look you want. A lot of the time I use black. Brown, blue, green or any dark color will work. Take a paper towel and wipe most of this coat off. It will leave the paint in the crevices of the texture. You can use a slightly damp paper towel on this step to take more of the paint off. Just be careful you don’t take it all off! You must move fast on this step. Only cover as much of the area as you can wipe off before it dries. Let this dry. It won’t take long. Sometimes I will paint and wipe with a second color. I use one of the colors that I will use in the design. A translucent color works great as it lets the colors beneath shine though. Once that side is done it is time to work on the other. Paint the bowl with one color. Paint the shapes on the bowl. I like circles and swirls or organic shapes. Think of it as a doodle on a bowl. Create as complicated or simple a design as you want. Once the painting on the bowl is completed I let it dry overnight. Even if it has dried to the touch it stills needs a little time to fully “cure”. The last step is to apply the varnish coat. I use artist acrylic varnish in gloss. Brush on at least two to three coats drying between each coat. Just like the other painting steps, do the inside then the outside. I do the rim of the bowl when I paint the inside. This is one method I use to make my bowls. All the bowls in the picture except two on the bottom right were created using this method. They are fun projects that work great for gifts. I also use paper pulp either the premixed just add water kind or Jonni’s recipe to make some of my containers. Instead of strips I apply the pulp like I am frosting a cake onto the plastic wrapped form. Let dry and then gesso, paint and finish. The third method I use is cast paper mache with Li-qua-che. This a more complicated process but only because you have to make your own plaster molds. It produces very smooth bowls. The ones pictured are all create from homemade plaster molds. Jonni created ornaments with this technique. Hi Lynn, your work is special and I thought I would try some bowls. Do I wet the shop towels for each layer or just the first layer. Thank you for sharing your ideas and beautiful work. hey! Your site is incredible! It’s just what I’ve been looking for.. I was hoping I could get some advice from you on a project of my own. 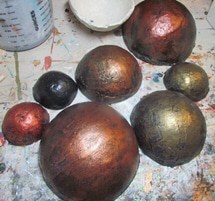 I want to make a paper mâché orb type thing as centerpieces for my wedding. We’re doing a starry night theme so the idea the to make it look like the night sky. 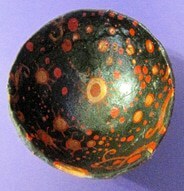 So far my plan is to make a paper mâché bowl very similar to what you have here. I would put it upside down with a battery candle underneath. My thought was to paint it blue and use a pin to poke holes in it like stars. 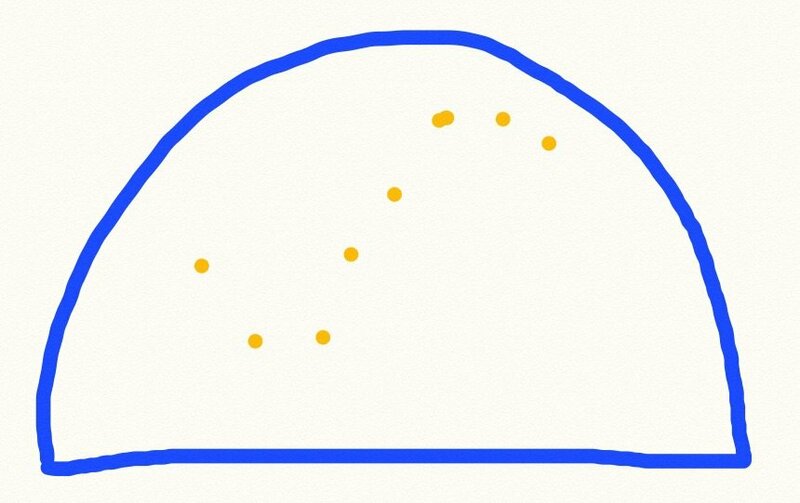 (See quick sketch I made on my iPad as example) do you think the pin sized holes would be big enough to let light through? It doesn’t need to be bright or anything, just enough that you can see the stars are there. And most importantly, do you think I’ll be able to poke the holes into the paper mâché? Thankssss! Hi Jess. I don’t know how the light will look through the holes, but you should be able to test that by poking holes in a cardboard box and holding it over a lamp. If it isn’t possible to poke the holes with a pin, you could use a very small drill bit. The pin would be less likely to tear the paper mache, but if it’s made too thickly the pin might not go through it. This sounds like a great idea, by the way. You’ll have a lovely wedding! Thank you Lynn. Wonderful table art, indeed. Love the flower! These bowls seem great for presenting any kind of dry food by using a napkin insert. When guests finish eating, say a muffin or sandwich, the artwork is revealed. Guess the possibilities are endless. Mostly, they just seem to be lots of fun to make. What a cool project, I love the whimsical look of your bowls! Thank you Lynn, for sharing your artistry and taking the time to include such complete instructions. I was surprised to see that the paper mache paste and shop towels alone could create a bowl that was sturdy enough without applying air dry paper mache clay. You’ve inspired me. Thank you, Lynn. Just wanted to be certain. Very nice! Love the colors. Can they be used for food such as salads? Or are they for non-food or wrapped food items? Can’t be used for food or anything with moisture. they can be cleaned with a damp cloth. I use them for hairclips, paper clips and wrapped candy. I think of them as table art. the picture is the one I worked on today. I really appreciate the fact that Jonni and her wonderful artist friends share so willingly their gifts and techniques. One thing confused me on this one in the segment on applying the gesso. She indicates two layers on the inside. Shouldn’t the outside get a layer, too? Thanks again for all the information and letting us see your beautiful work. It was fun writing up. Yep, both inside and outside should get one or more coats of gesso. Sorry I missed that.